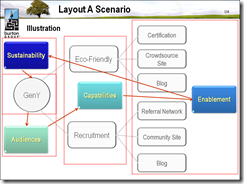 10 had seemingly reached a point where they felt they should look beyond what SharePoint offers out-of-the-box, via Codeplex and through customization - and explore where partner solutions can augment current capabilities, fill in gaps, or replace weak capabilities (e.g., SharePoints wiki which one person agreed with the metaphor “it’s not really a wiki, it’s more like a rich page editor”). Many of those 10 were most open to NewsGator, Telligent, and Atlassian. IBM Lotus Connections came up in a few of the conversations but unless the client already had WebSphere Portal or Notes/Domino, there seems to be some hesitancy to rekindle past wars over e-mail and collaboration – not really a Connections critique at all, but more of an IBM/Lotus vs. Microsoft debate. Most of those 10 also seemed to be in various stages of disappointment with (1) the functionality of its social software (2) the long lapses between releases and (3) uncertainty that things will get dramatically better in the next version (Note: Those familiar with Microsoft’s internal effort called “TownSquare” were more optimistic and would like that solution now – although it is unclear whether that solution will be in the next release). Only one session did a client actually seem intrigued with Codeplex and that was only after I explained the best way to look at it (e.g., not as a Microsoft product but as something that is better than building it internally since virtually all shops customize SharePoint anyways). If you set expectations correctly, it can be a decent option. (Note: Microsoft should really support these extensions – or they need to go back to feature/function upgrades via service packs - people are getting very grumpy over the three year release cycle that, when it does come out, delivers functionality that is behind where the bar has now been set). The two OCS meetings were much more positive – one client seemed to be at a 12K deployment level (the largest I have found “in the wild”) although there are concerns often regarding interoperability with PBX vendors (especially when it comes to rich presence) and the overall maturity of the platform. 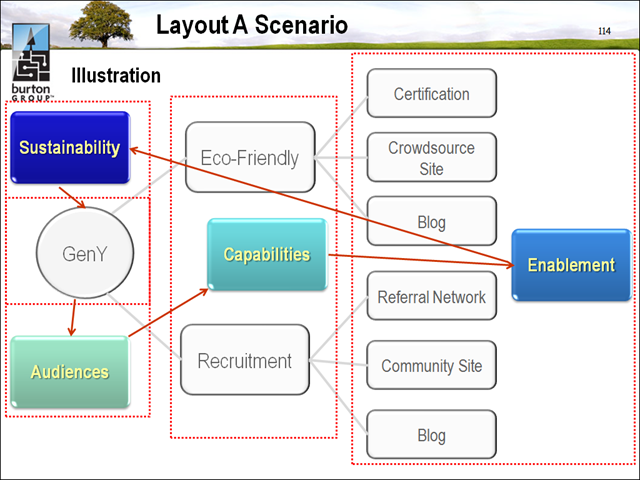 That's it ... back to writing my reference architecture template on social network sites. At our Catalyst conference this morning I delivered a 4 hour tutorial on social media covering a variety of issues related to external and internal adoption. 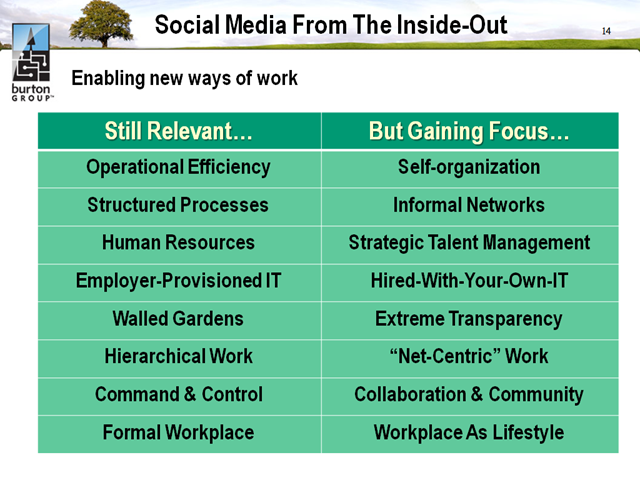 Below are several screen shots that provide some insight to what was discussed and how such concepts can help organizations to frame the conversation when considering business and organizational strategies in this area. 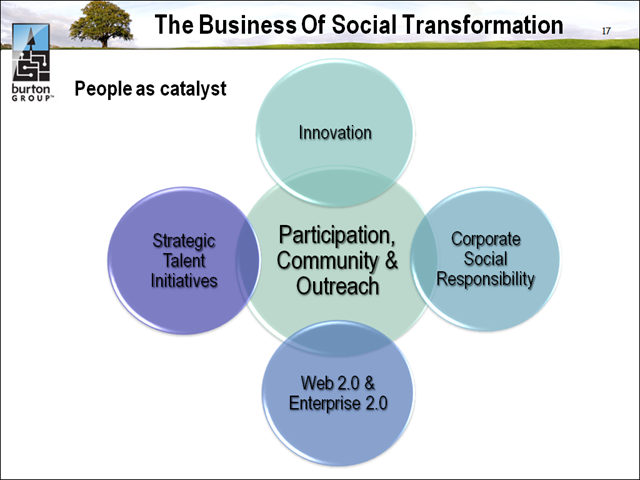 The tutorial organized the social media discussion around four drivers: innovation, user-led innovation, corporate social responsibility and strategic talent initiatives. 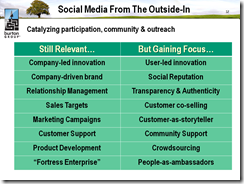 The common thread: participation, community and outreach. We also reviewed several social media examples: Kodak, GE Research, Patagonia, Deloitte, Down Chemical, Cisco, Abbott, McDonald's, Wal*Mart and Zappos. 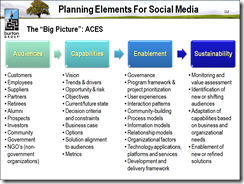 "ACES" reflects two sides of the social media coin. There is one perspective on social media that relates to participation, community and outreach. 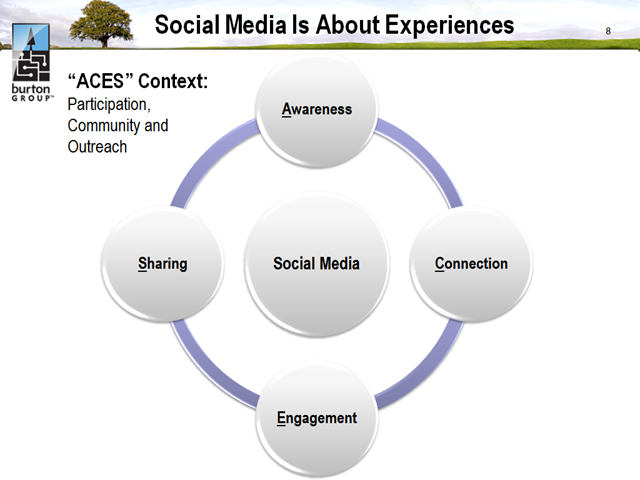 In this context, the focus is on "awareness", "connection", "engagement" and "sharing" as fundamental tenets. But there is also a flip-side to social media that examines the strategic planning and governance program necessary to execute on the effort. 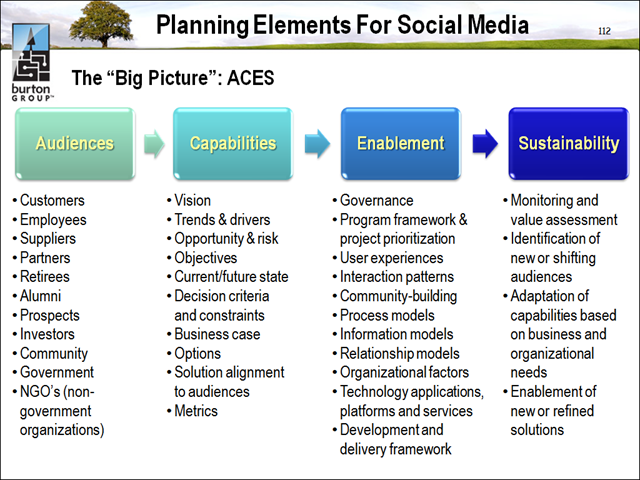 In this context, the focus is on "audiences", "capabilities", "enablement" and "sustainability". The next-generation user experience is focused on empowering users through rich interfaces and simpler infrastructures that provide personalized and contextual interaction with co-workers and resources. Consumer-oriented services such as Facebook and Google, increased mobility, and SaaS software delivery models are influencing the marketplace offering more options for enterprises to support different working models and styles. Enterprises will find 2008 to be an excellent year for studying and strategizing, in preparation for moving forward. Principal Analyst Mike Gotta explores some of the trends in next-generation user experiences and how the market is evolving. Organizations face a variety of strategic business and human capital challenges related to growth, customer relationships, and workforce agility. Increasingly, decision-makers are betting that a new wave of social applications will foster the type of gains in productivity, customer loyalty, innovation and ultimately, business transformation, needed to address those challenges. 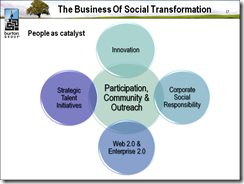 Social software, including blogs, wikis, social bookmarks, RSS feeds, and social networking, helps establish the technology foundation for "new ways of work". In this keynote session, Principal Analyst Mike Gotta discusses how organizations are deploying social software and how such social applications might deliver business value. Speakers from Avery Dennison, Colgate-Palmolive, Deloitte and Harvard University will participate. Blogs! Wikis! Emergent communities! 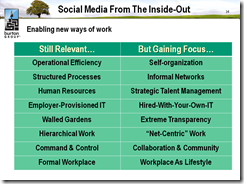 Innovation from the edge fuels the empowered worker! And it all scares the pants off most corporate executives. 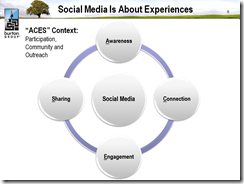 People familiar with the power of social computing want to see more of it at the workplace. They believe it will make them feel more connected, just like it does in their non-work lives. Those responsible for managing the corporation see potential productivity losses and security risks. More ominously, the fluid nature of social networking runs counter to corporate hierarchies. Can that be allowed? Can it be controlled? In this session, Executive Strategist Jack Santos and Principal Analyst Mike Gotta explore the tension between E 2.0 concepts and corporate structures, suggesting ways that E 2.0 can be advocated to the queasy. In this keynote session, Principal Analyst Mike Gotta and Senior Analyst Mark Cortner will discuss the key trends in unified communications and strategies to extend real-time communication and collaboration within and beyond the enterprise network.